First of all, be sure to have at least version 1.5 of Java Runtime Environment (JRE) installed on your computer. If not, you can download the latest version from the Sun website. Download latest version of the MALDIPepQuant distribution from here. Unzip the archive anywhere on your computer. This will create a new folder called MALDIPepQuant. Double click on the file called REPLACEBYVALUE inside the folder MALDIPepQuant/exe/. Main window of MALDIPepQuant should appear. Fill out the fields according to the following informations and click on the Start... button. Note: if you put a small file containing the path to the Excel executable in your home folder on your computer, MALDIPepQuant will be able to automatically open its output file after it has finished. This is the label used to indicate the position of the heavy amino acid. Allowed error on the mass (Dalton). Weight added to the heavy amino acid. An Excel export from Phenyx. 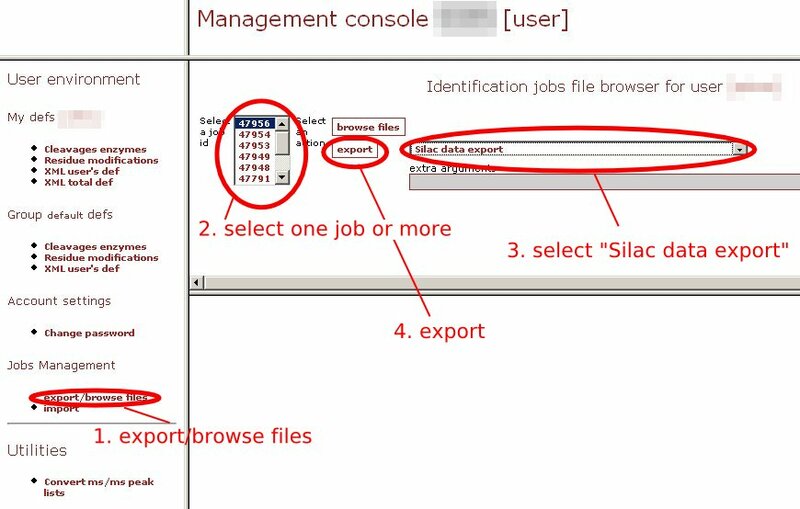 See export named "Silac data export" in the Phenyx management console. 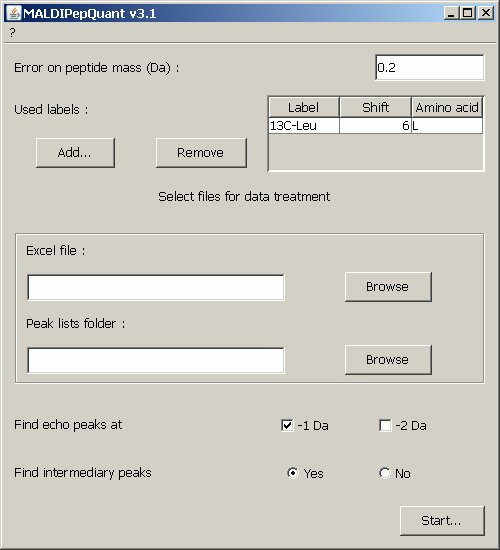 Folder containg all the MS peak lists in mgf format, as generated by a MALDI-TOF/TOF 4700 or 4800 from Applied Biosystems. Click on the Browse button, select one of the MS files and in the "File name" field replace the Label element by a #. Select echo peaks you want to search. You can select either -1Da either -2Da, or both. Select this option if you think that the heavy amino acids were only partially incorporated. Output file will be created in the same folder as the original Excel file (Phenyx export) with the "quanti_" prefix added to the original file name. This file contains a copy of the original sheet and one new sheet per exported Phenyx job. Number of labeled amino acids in this peptide. Observed forms for this peptide. Labelof the MS spectrum followed by the masses found (light form/heavy form/eventual intermediary forms). Peak area found for the light form of the peptide. This column is followed by its eventual -1 and -2Da informations. Peak area found for the heavy form of the peptide. This column is followed by its eventual -1 and -2Da informations. Depending on the parameters, it will also be followed by the columns containing informations about the intermediary forms of the peptide. Sum of the peak areas of the light forms of the peptide. Sum of the peak areas of the heavy forms of the peptide (including eventual intermediary peaks). Ratio of the sum of the light forms divided by he sum of heavy forms.